No one wants to reach for more toilet paper or the next bottle of shampoo to find you don't have one of these supplies available for immediate use. 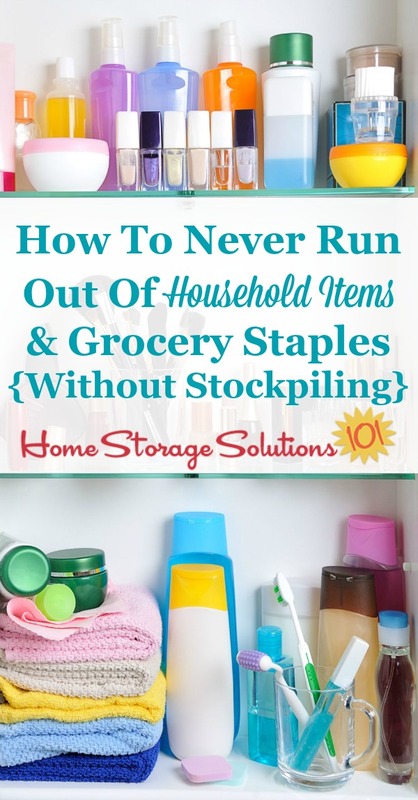 Here's how to never run out of household items and grocery staples without having to create a stockpile, and it will even work if your family doesn't tell you when they've almost used all of something! One of the missions in the Declutter 365 series is to declutter your couponing stockpile, and then organize what you've got left. The reason I have this mission is that when you buy things using a strategy to purchase them at a very low price it makes sense to stock up when there are sales. This can lead to large stockpiles of certain household products, like laundry detergent, shampoo, toothbrushes and toothpaste, as well as lots of canned goods and other pantry staples. If you're not careful though, the stockpiles can get too large for the space you've got for them, or products can expire or get quite old if not used quickly enough. 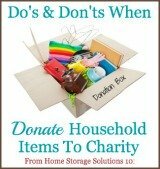 To avoid this you've got to keep things organized and clutter free, which takes effort and work. Let me make clear, there is nothing wrong with stockpiling as long as you have the space to hold the items you've purchased and you are willing to expend the effort necessary to rotate and use your stockpile effectively so that this technique does, in fact, save you money. However, there are a lot of people that have weighed the costs and benefits of creating and maintaning a stockpile and have chosen, for themselves, that they don't want to expend the effort. That is also a perfectly acceptable choice. 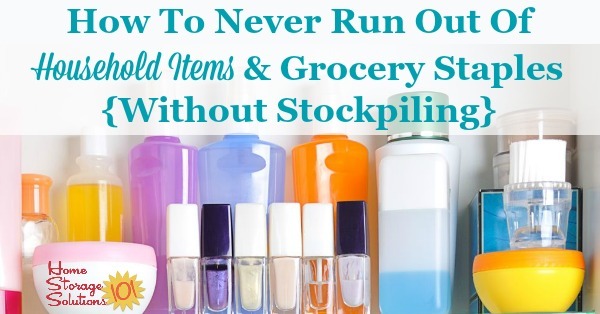 If you're a person who does not have the desire and/or the space available to stockpile household items in your home, I know that you still want to keep yourself from being inconvenienced by running out of staple products you use regularly. When this happens you're inconvienced by either having to go without something you normally use for a while, until you can go to the store for more, or needing to make a special trip to the store just for that item. Neither is ideal, but you can avoid that problem!!! So here's my extremely simple organizational tips for making sure you never run out of these household supplies ever again, and always have frequently used items available in your home for use when you need them. Many of you, I know, when you read my tips below will say, yeah, this is simple and common sense. IT IS! I don't deny it, and I never said I invented this method. In fact, my mother taught me, perhaps like many of your mothers taught you this. But the reason I've written this article is because, one, not everyone actually does this already, and two, because I have a suggestion for when you, or your loved one, doesn't follow through with step 2 of the process below, which I find very helpful, especially now that I have kids who are very bad about actually doing one of the vital steps. The first step is to make sure that for all household items that you use regularly that you have one of these items in use, while you have another ready as backup. This is as simple as having one bottle of shampoo you're currently using, and one bottle of shampoo in your bathroom cabinet ready to grab and begin using as soon as you've finished the current bottle, to give an easy example. This is a different concept than stockpiling because I'm not telling you to have 7 bottles of shampoo, for instance, that you've bought on deep discount. I'm saying have just one backup bottle. You should follow this rule of one in use, and one as a backup, for anything you use regularly. This includes personal care products like lotion, hair care products, and soap, household supplies like toilet paper, paper towels, and cleaning and laundry supplies, and even food items (assuming they will not spoil), such as shelf stable pantry items or things you can freeze. To follow through with my example about the shampoo from above, the next step in the process is to write down on your shopping list or grocery list that you need a new bottle of shampoo as soon as you finish one bottle and begin using the next bottle. Don't wait to put shampoo on your list once you've used three fourths of that second "backup" bottle. Instead, put it on your list to buy the next time you're at the store immediately when you begin using the backup bottle. This method of buying the next backup item immediately does not allow you to take advantage of store sales as much as stockpiling, but that is OK. You have chosen to value your time differently than just purchasing items at the lowest price, and that is a perfectly legitimate decision. The reason that you want to purchase your next backup item right away is because we've all sometimes forgotten something on our list, or the store has been out of the product we need. If you try to purchase it right away and one of these problems arises it isn't a huge deal. Transfer the missed item onto next week's list and try again. You've got time before the newly opened bottle of shampoo is used up. What you gain by buying the backup immediately, instead of waiting, is that you can, without stress or inconvenience, get your next bottle and avoid hassles later on. Now, a quick word about multi-packs of things like soap, where instead of buying one bar of soap often you buy a package with six bars. Or another example would be toilet paper. No one buys toilet paper one roll at a time, they come in multi-packs with lots of rolls. In these instances use common sense about how much of the pack you want to use up before adding it to your list as a backup. With the soap example you do not need to buy another multi-pack of soap when you've got five bars of the previous pack still left. Assuming your family doesn't go through a bar of soap a day, but instead it takes a couple weeks to use a bar, you've got approximately 10 weeks to buy more soap. You might choose to add soap to your list once you have two bars left, meaning you have about four weeks of soap left. On the other hand your household could go through one roll of toilet paper quite quickly, especially if there are guests or an illness in the family. So if you're down to one roll of toilet paper in the multi-pack left you most likely have already waited too long to add TP to your next shopping list and get it at your convenience. At that point, with one roll left, you're probably in crisis mode actually, which is what we want to avoid. So, perhaps your rule of thumb for toilet paper would be when half of the multi-pack is used it is time to put another multi-pack on the grocery list. You get the idea. Choose a time period that gives you ample time to go to the store at a convenient time for you, where you're able to get all your shopping done at once, without extra runs for forgotten or emergency items. You may be thinking, after reading this, "well that's all fine and dandy but my __________ (fill in the blank) never tells me when we're almost out of ___________." Yep, it's a common problem, and one I've definitely experienced first hand. I've got three kids and kids do not always seem to listen when you give them instructions, at least not consistently, and therefore may not follow the rule of telling you when they grab the last toothbrush, or start using another stick of deodorant. So I've definitely heard, "Mom, I need shampoo." And I ask, "how much do you have left?" to guage how quickly I need to buy it, and the answer is, "none." Ugggggggghhhhhh!!!!! In addition to people in your household not telling you this type of information, you yourself may get in a hurry and forget to write down the backup item you now need on your list. It has definitely happened to me. Hey, we're human, right? This is the flaw in this plan which can trip people up, EXCEPT I've come up with a way to avoid it. What you need to do is set up a system to do a very quick inventory check of certain supplies about once a week, or once a month at the minimum. Before you roll your eyes and think this would take way too much time, let me assure you this takes very little time once the process is set up. All you need to do is think about the types of items in each area, like your laundry room, bathroom, and kitchen, where you store certain household items as backups, and write down a list of them. As an example, in the bathroom your list may include deodorant, lotion, shampoo, conditioner, razors, soap or body wash, toothbrushes and toothpaste, and feminine hygiene products. Keep these lists that you create for these storage areas either in your household notebook or, even better, in the room in which you store these backup items. So for the bathroom items, which you keep in your bathroom cabinet, for example, you could tape this short list inside one of the cabinet doors. Then, as you clean that room, say as part of your weekly house cleaning schedule, look at your list and compare what you always want to have as a backup item to the actual backup items stored there. If someone has grabbed the next bottle of shampoo but not told you this, doing this simple step will give you a chance to notice it easily and earlier so you can get it on your shopping list now. This method keeps you from solely relying on household member's input for when to put items on the shopping list. I hope this helps you avoid the inconvenience of realizing you don't have something you need to use regularly, without feeling like you've got to keep a huge stockpile of household items in your home if you don't want to.